Welcome to the Haleakala National Park Information Page. The nearest major airport is Honolulu International Airport. The main airport is in Kahului, in central Maui. Major airlines fly from the U.S. mainland and inter-island flights are common between the main Hawaiian islands. Haleakala National Park extends from the 10,023 foot summit of Haleakala and down the southeast flank of the mountain to the Kipahulu coast near Hana on the Island of Maui. These two sections of the Park are not directly connected by road, but both can be reached from Kahului. The Summit area of Haleakala is a three hour round trip drive from Kahului via State roads 37, 377 and 378. Follow the signs posted along the Highway. The Kipahulu area of the Park is at the east end of Maui between Hana and Kaupa. It can be reached via Highway 36, a curvy, often wet road. Kipahulu is about 90 miles from the resort areas of Wailea or Kaanapali, and 60 miles from central Maui. Driving time is about 3 to 4 hours each way. An extension of this road, Highway 31, goes around the dry side of the island, past Kaupa and on to Ulapalakua. It is only partially paved and can be hazardous or closed during periods of stormy weather. Access the Summit Area by State roads 37, 377 and 378; Kipahulu by highway 36. There is no public transportation on Maui. Once at the park, you can travel by personal or rental vehicle, bicycle, tour bus, van or taxi (arrangements not made by Park). Haleakala, originally part of Hawaii Volcanoes National Park, was re-designated as a separate entity in 01 July 1961. Haleakala National Park was designated an International Biosphere Reserve in 1980. Of its 28,655 acres, 19,270 are wilderness. 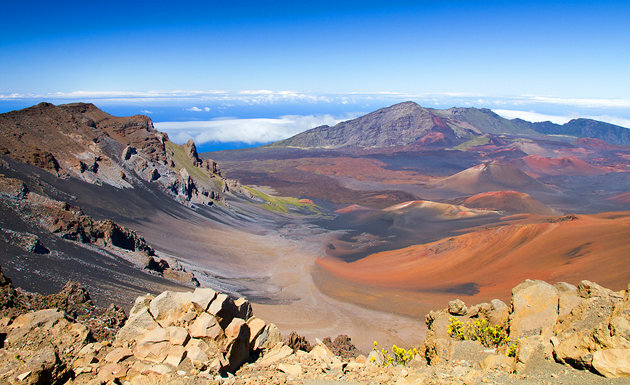 Haleakala National Park was established on the island of Maui to preserve the outstanding features of Haleakala Crater. Later additions to the park gave protection to the unique and fragile ecosystems and rare biotic species of Kipahulu Valley, the scenic pools along Obeo Gulch, and the coast. In the Summit area, Park Headquarters,Haleakala Visitor Center and Hosmer Grove picnic are wheelchair accessible. Accessible restrooms are located at Haleakala Visitor Center, Kalahaku Overlook, Park Headquarters, and Hosmer Grove. Accessible water fountains can be found at Park Headquarters and Haleakala Visitor Center. The Summit Building is accessible, with assistance, via a steep ramp. Park trails are currently unpaved and not suitable for wheelchair use. In the Kipahulu area, there are accessible parking spaces and restrooms near the Ranger Station. The only paved portion of trail leads to the Ranger Station. At this time the trails leading to the pools and the forest are muddy, steep, and rocky. Access beyond the paved trail is difficult for wheelchairs and persons requiring assistance. Plan on spending at least two hours in the Park to drive up to the Summit and back to the entrance, longer if you plan to hike or attend natural or cultural history programs. One could spend all day or a few minutes enjoying the pools and scenic beauty of Kipahulu. Take time out to visit the ranger station, take a short hike, or plan a picnic. The weather at Haleakala is unpredictable; be prepared for cold wind, heavy rain, and hot sunshine. No dining or vending facilities are available in the Park, so plan your visit wisely. Also remember that there are no gas stations in or near the Park. Think Ahead! Persons with heart or respiratory problems and pregnant women should check with their doctor before coming to the Park, given the reduced oxygen at high elevation. Biking on your own can be done on the Park road, but not on any trails. Lights are required pre-dawn or after dusk. Helmets are strongly recommended. Gloves and rain gear will make your ride safer and more comfortable. Bikes can be rented on the island. Haleakala National Park encompasses the upper slopes of the volcano, with its subalpine cinder desert and rainforest areas, and stretches down the southeast flank to the Kipahulu coastline. Overnight facilities include two drive in campgrounds, two wilderness campgrounds, and three wilderness cabins. The drive-in campgrounds are located at Hosmer Grove at 6,800 feet elevation near Park Headquarters and on the coast in Kipahulu, 40 minutes south of Hana. Entrance Fees are valid (with receipt) for re-entry into both the Summit and Kipahulu areas of the park for the duration of the pass. An entrance fee is required for those camping within the park. There are no facilities to purchase food, gasoline or supplies in the Park. There is no drinking water at Kipahulu. The towns of Kahului, Pukalani (17 miles from the Summit area), and Hana (10 miles from the Kipahulu area) have limited stores and outfitters. Several private companies operate tours within the Park. They include downhill biking on the Park road, horseback tours of the wilderness, and guided hikes.Check the yellow pages of the Maui phone book, the activities desks at hotels and resorts, or consult the Hawaii Visitor’s Bureau for information. Haleakala National Park stretches from the rugged Kipahulu coastline up through rainforest and shrubland to the summit of the volcano. Much of the rainforest and upper slopes are designated wilderness, ensuring that the primeval character of the area will remain. Though many people refer to the summit’s cinder landscape as a “crater”, it is actually a valley carved into the volcano by thousands of years of erosion during a period of dormancy. Renewed volcanic activity has partially filled in the valley with cinder cones and lava flows, which can be viewed from the Haleakala Visitor Center if weather permits. To experience different perspectives of the Park, plan to hike in. Lodging and Camping Facilities: There are no hotels or concessions within Haleakala National Park. For information on camping, see the Camping Page. There are three primitive wilderness cabins at Paliku, Kapalaoa and Holua, which were built by the Civilian Corps in the 1930’s, are maintained by the National Park Service for visitor use by advanced reservation lottery. Pets are not allowed in the wilderness area or on trails. Pets are allowed at Hosmer and Kipahulu Campgrounds but must be leashed when out of vehicle. No reservations are required for programs, hikes, or camping. Permits for the wilderness campgrounds in the Summit area are available on a first come, first served basis. Wilderness cabin permits are on a lottery system run by the Park. See lodging and camping facilities section for details about camping and cabin permits. The weather at the summit of Haleakala is unpredictable. Temperatures commonly range between 40 F and 65 F, but can be below freezing at anytime of year with the wind chill factor. Weather changes rapidly at high elevations on Haleakala. Intense sunlight, thick clouds, heavy rain and high winds are possible daily. Wear lightweight, layered clothing that will keep you warm even in wet weather, and sturdy, comfortable shoes. NOTE: Persons with heart or respiratory problems and pregnant women should check with their doctor before coming to the Park, given the reduced oxygen at high elevation. Protect yourself/ Protect your park. Trails are rugged, strenuous and at high elevation. Be prepare for self rescue in the event of an emergency. No food, gasoline, supplies, showers, or electricity are available in the park. Park regulations protect the unique plants, animals and insects that live here, while allowing visitors to experience the diversity, solitude and beauty of the area. Hiking off-trail is prohibited as the flora and fauna of the park are very fragile. All natural resources are protected; do no remove plants, rocks or flowers, or build rock cairns. Do not harass or feed nene or other wildlife. Personal grills may be used at Hosmer and Kipahulu Campgrounds if raised off the grass/table. Bicycles and other vehicles are not allowed on trails or in wilderness. Pack out all trash, food and personal gear. Possession of firearms and hunting are prohibited. Respect others’ right to quiet solitude. Pack animals are allowed overnight only at Paliku and Holua corrals. Skateboarding, roller blading, hang gliding are prohibited anywhere in the Park.